The 2017 calendar of events rounded off in style at the Landmark London Hotel on Monday 4 December. 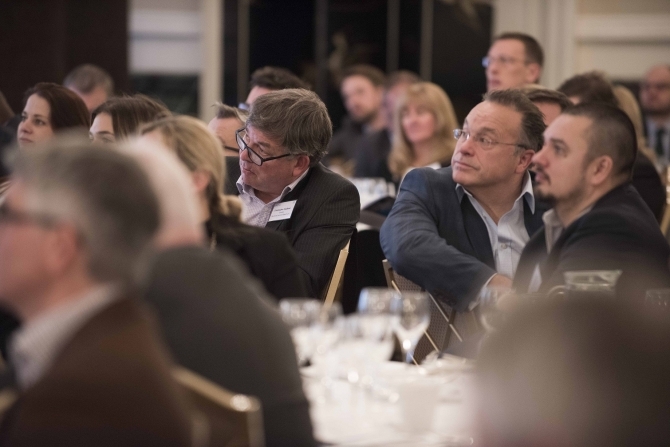 Nearly 200 hospitality professionals gathered with colleagues old and new to make the most of the opportunity to gain valuable insight and inspiration that could prove beneficial to their businesses in the year ahead. The action-packed programme included a whistle-stop tour of the past 12 months, with a glimpse at what 2018 may hold, with Peter Backman; alternative perspectives from industry disruptors Peter Georgiou of SUPPER and Joe Moore of Crust Bros; and the experiences and wisdom of ‘retail veteran’ Roger Whiteside, the CEO of Greggs. The 2017 calendar of events rounded off in style at the Landmark London Hotel on Monday 4 December. Nearly 200 hospitality professionals gathered to kick-start the festive season with colleagues old and new, and to make the most of the opportunity to gain valuable insight and inspiration that could prove beneficial to their businesses in the year ahead. The action-packed programme included a whistle-stop tour of the past 12 months, with a glimpse at what 2018 may hold, with Peter Backman; alternative perspectives from industry disruptors Peter Georgiou of SUPPER and Joe Moore of Crust Bros; the experiences and wisdom of ‘retail veteran’ Roger Whiteside, the CEO of Greggs; superb five-star food, drink and hospitality; a dash of audience participation; and a wonderful £1100 raised for Hospitality Action and Springboard. “Amongst the doom there are some great stories out there.” This was Peter Backman’s take away message as he took the audience through the highs and lows of 2017, a year that offered a mix of good and bad news. The headlines include: The falling value of the pound evident in London shifting from the 6th most expensive city in the world to the 24th; food and beverage costs rise steeply; the delivery market continues to grow and is set to top £8billion in 2018 (it’s market size was £5.3billion in 2016); immigration falls by one third as part of the Brexit effect; the consumer is reluctant and investors are holding back; and facing the challenges head on, our creative and flexible industry continues to be innovative and exciting. Looking forward to 2018, Peter’s forecast was that businesses would be prudent to exercise retrenchment (cutting back on overheads, unfunded expansion and waste) and review prices, costs, people and property. Peter was joined on stage by two entrepreneurs, who are seen to be ‘breaking the mould and doing things differently’, to discuss the rise of delivery; a phenomenon that Peter Georgiou, the CEO of SUPPER, and Joe Moore the CEO of Crust Bros, have wholeheartedly embraced. In today’s ‘Amazon age’, UK consumers expect delivery and foodservice has not escaped this. There is an appetite for delivery and, like it or not, it’s here to stay. Delivery produces opportunity. It’s a great way of helping independents increase revenue without increasing floor space and, just like the rise of street food, it enables those who don’t have the capital to establish a restaurant to put their amazing product in front of customers. Having said that, everyone agreed that there will always be room for ‘bricks and mortar’ and the delivery models evolving in London may be more difficult to execute outside of the capital due to footfall and the proximity of the populous. Following a lively drinks reception, during which guests enjoyed great conversation, delicious Bottega, courtesy of Matthew Clark, and tasty canapés, thanks to Délifrance, the action returned to The Ballroom for Lunch. Before guests tucked into their fantastic three-course lunch, with wine, our soft drinks partner, Britvic, got everyone on their feet in a fun game that gave an insight into the soft drinks market. It was then Roger Whiteside’s turn to take to the stage. He informed and entertained the audience with his career anecdotes, strategy stories and very astute and grounded approach to business, retail and the industry. Roger has been in retail all his life – in fact, he was once described as a ‘retail colossus’! He learnt his trade at Marks & Spencers, joining straight from university, and 20 years later he was heading up its food business. In the year 2000, Roger caught dot.com fever and gave it all up to join an internet start-up business. He made the move on 1 April and everyone thought he was pulling an April Fools gag. Nine days later the internet bubble burst. Fortunately for Roger, Sir Charlie Mayfield had seen coverage of his career move in the Sunday Times and his interest led to the John Lewis Partnership providing funding to his new business and allowing the use of the Waitrose name, and the Ocado seed was sown. Four years later, Roger decided it was time to leave Ocado and looked for a new CEO role. He found himself in his first turnaround challenge at Threshers, where time was running out. He was able to do enough to sell the business and he learnt a key lesson – exit strategies are important. Next came a completely different turnaround challenge. Punch. On his first day he was greeted at head office by protesters carrying a coffin! It was clear that he had to deliver a turnaround and cultural change. He succeeded in his objectives. Whilst CEO of Punch, he was also a non-executive director at Greggs and when the CEO Ken McMiekan left in December 2012, he was offered the post. He was hesitant, as Punch was doing great things and he was surrounded by great people, but the bottom line was he was born to manage retail brands. 2012 had been the worst year in Greggs’ history so he found himself taking on another business in trouble. When things didn’t get better in the first quarter of 2013, he saw this as his lucky break as it meant he could deliver his own strategic review. He presented 19 hypotheses that he believed to be true of the business and within 8 weeks he presented his new plan; to stop competing in the take-home market and start in the food-to-go business. Looking at who the Greggs’ customer was and what they were doing, it was evident that the vast majority were buying to eat instantly and not to take home. It was time to transform and focus on those using Greggs for food on the go. The plan was simple. To serve great-tasting food, review the pricing structures recognising that value comes in meal deals with drinks – particularly coffee, and to be known for serving fresh-baked, freshly-made products at value prices. The shops also had to change. Roger described them as ‘walking into the film set of Life on Mars’. They were quickly transformed to allow space and seating for customers, with longer opening hours, including Sundays. Greggs also needed lots more shops. Convenience is the number one driver for custom, so you have to be visible to be in play. Greggs now has 1865 shops with a target of 2000 – but Roger stated that they won’t stop there. The menu was changed to reflect growing food trends and opportunities – namely breakfast, healthy eating and hot food. Production was also centralised into centres of excellence. Greggs’ transformation has been a resounding success, with the business tripled and enjoying unbroken growth for nearly five years. However, Roger was keen to point out that this was not a turnaround. The business started to improve within weeks of the renewed focus, which means it was a great brand already. New opportunities are opening all the time. Staying close to the customers, Greggs is looking at customised food and it’s dipping its toe into delivery with UberEATS in Newcastle. This will unlock the evening day part, the busiest time for delivery. “Will it work? Who knows?” said Roger. Roger, of course, wants Greggs to be commercially successful but not at any cost. He takes the business’ responsibility very seriously. As a market leader in the most indulgent category, Greggs promotes healthy eating through its Balanced Choice range. He obviously wants people to come to Greggs for a sausage roll, but, in a society facing an obesity crisis, this should not be every day. Community involvement is very important within Greggs and scores highly in employee surveys – and this is evident in the gusto with which teams embrace Children in Need activities. Looking after its staff is crucial to the success of Greggs, according to Roger. Employee surveys show that how someone feels about where they work is more important than pay, and this has been recognised. With 17,000 of the 20,000-strong workforce based in the shops, the framework is loose enough to enable each team to get on with each other and thrive. When the minimum wage was introduced they did not take away any perks to balance this out, the business took on the extra cost. And, Greggs has just signed the mental health pledge, recognising this is an important area to be addressed for all. Everyone at Arena would like to thank you for your support throughout 2017. We wish you a very Merry Christmas and a Happy New Year!